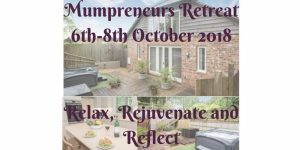 “The Mumpreneurs Weekend Retreat was absolutely amazing. The cottage was beautiful and had a homely feel to it, which helped very much in making us feel comfortable. I was surprised to see our host, Serena, cooking for us but this made it all the more special. She also facilitated some activities, including Visioning, which challenged us to step out of our comfort zones and delve deep into ourselves to help us to remember who we are as individuals and not just as mothers and professionals. We were given plenty of space to have time to ourselves to relax, rejuvenate and reflect. The onsite Hot Tub helped greatly with the relaxing part. On the Sunday we went on a Reflection Walk and I chose to go to a nearby field by myself to sit and think about how far I’ve come and where I’d like to be. It was great because there was no pressure to stay with the other ladies. I was given the space to do whatever I needed to keep my focus on me, as that was the overall purpose of the retreat – focusing on ourselves. Every single thing that our host, Serena, done for us was done with love and thoughtfulness. It’s very rare that I put myself first and take time out for me so this was really needed. I felt re-energised and ready to get back to business, but I now value the importance of being still sometimes. I especially valued the conversations in the evenings as we were able to speak openly about our experiences without judgement. I really hope that Organising Mum will do this event again next year so that other professional mothers get the opportunity to experience at least a part of what I did. If I would have to rate this weekend, I’d most definitely give it 10 out of 10″.